A small book by John Irving. I never knew it existed, until I bumped into this book in a sale. 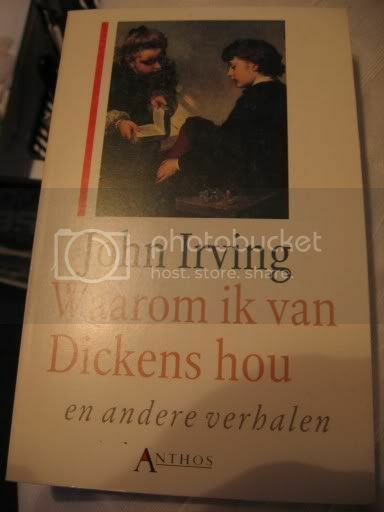 Apparently it is a book only for the Dutch market, with some essays and extracts. Somehow Irving has a special relation with my country; his last book was released in the Dutch translation before the original was published. The book before that (a widow for one year), was set for big parts in Amsterdam. The first essay, also the one that gave the title to this book, “Why I love Dickens”, is a long introduction to Dickens’ Great Expectations. I agree with Irving that Dickens is one of the best authors ever (he even named his dog after the author), though I doubt if I could write over 30 pages why that is. The first story is about an urologist who is dedicated to his job, but ends up in weird situations because of that. According to the book it was written as ‘interior space’, though I don’t know if it was published separately or in a collection. In 1987 he wrote ‘When a country so grossly mistreats its citizens it heaps shame upon itself’, which was aimed at South Africa at the time. With the benefit of hindsight, I am fairly curious if this short essay (if we may call a two page story that, it is more like a pamphlet), is still read in the USA these days. The last story in the book is an extract from ‘Piggy Sneed’, a book most fans will have read, including me, though read separately it still is interesting. A book for John Irving adepts, he certainly has plenty.